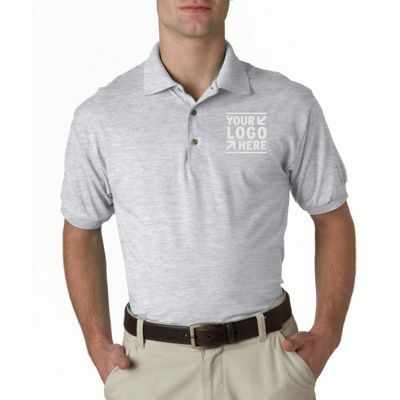 Go with professional casual with the Gildan DryBlend (R) Adult Jersey Polo. It’s available in sizes S-5XL and is made using preshrunk 50% cotton/50% polyester jersey knit blend. 6 oz. of DryBlend technology delivers moisture-wicking properties. It features a contoured welt collar and cuffs, three wood-tone buttons on a clean-finished placket with a reinforced bottom box, double-needle bottom hem, quarter-turned construction to eliminate the center crease and a heat transfer label. CARE INSTRUCTIONS: Machine wash warm, inside out, with like colors. Only non-chlorine bleach. Tumble dry medium. Do not iron. Do not dry clean. PLEASE NOTE: Apparel pricing changes weekly. Please check for current pricing before submitting your order.